Much to my children's chagrin, while we were in South Bend I squeezed in a quick visit to the Saint Mary's bookstore. My 'quick' translates to 'forever' for my offspring. Several months ago I managed to lose my favorite (and only) SMC sweatshirt. Supposedly. (I still believe one of my kids did something to it, or abandoned it on the bottom of their closet floor when it got mixed in with their laundry). I planned to finally replace it, even though I firmly believe that the sweatshirt is still somewhere in our home. I believe this because I have no idea where I could have lost it. Could I really not have noticed that it fell off of the stroller? I occasionally would drape it over the stroller when I treat the kids I sit for to a day at the zoo or the arboretum or the park. For the longest time I refused to admit that I had lost it, because I find it so difficult to fathom. I'm a grown up. Damn it. Lost sweatshirts are for sweaty kids at recess, or irresponsible kids at baseball games, or kids with so many hand-me-downs they just don't care. How could I lose an article of clothing? 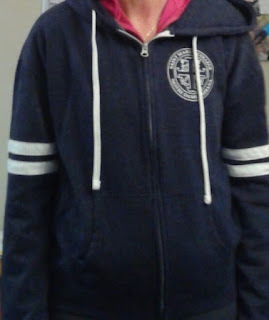 My Saint Mary's College sweatshirt was my go-to as an added layer for almost four years. Here it kept me cozy on our trip to Glacier National Park in June '16. I kept telling myself that I had left it in the car. On a sunny fall day, I would often peel off this extra layer for the drive home. It is a chore to haul in three tots, diaper bags, cooler bags, etc. and hustle everyone up for naps after one of our outings. After a good search of the car before Christmas, reality began to set in. I bought the sweatshirt when I returned to SMC for my reunion back in 2013. I struggled with the decision to buy something that wasn't on the sale rack - as I am typically prone. I went back and forth between other options with half zippers and no hood. In the end I splurged, and it has been my constant companion ever since. Unlike the variety of articles of clothing in my closet like multiple pairs of jeans, several similarly colored shirts, and tons of dressy options, I only had one sweatshirt. Never saw the need for extras. It had a hood and it zipped all the way down the front. I am always cold, so a layer that I could easily put on and take off without doing damage to my typically magnificent looking hair style (OK, this is far from accurate) was preferred. So I decided to shop for a new version. Although I secretly hoped they would still have the same exact version, I knew that was not likely. Of course the bookstore no longer carries my fave, so I wandered around trying to find something equally awesome. The longer I hesitated, the more heckled I was by my offspring. A few kids (basically the younger ones who still care about my happiness) tried to sell me an item they thought I would like. The others just rolled their eyes and poked fun at my disappointment and indecisiveness. New sweatshirt. Less fabulous than my fave. I finally settled on a dark gray sweatshirt. No where near as wonderful. The fit is odd. I usually wear a medium in sweatshirts because I like to leave room for added layers. This deal-io is somewhat short wasted. I required an XL. I haven't been able to cut the tags off of it yet. Still just bummed. for 30 days. I kicked myself for a moment after I hung up for not realizing it was officially missing right away. Balancing on my belly on the washer, I peeked behind it. I found a soft blue throw blanket, but no sweatshirt. I asked Eddie if he could look around the teenage car in case it found its way in there. When and if I uncover my original in the bottom of one of my kids' closets, they better run like the wind! (although I will probably be so elated, that I'll be incredibly forgiving). I completely sympathize. I am mourning the loss of my plain hunter green sweatshirt that I misplaced 6 months ago. I hope you find the original. I am wondering if your sweatshirt is from Saint Mary's College on the Chesapeake Bay in Maryland. My niece went there. That is the only Saint Mary's I know. But I will understand if you wish to remain silent on that point. I guess if I were like my kids and I owned a dozen sweatshirts this wouldn't be such a big deal - but I'm very particular. Darn it. No - different St. Mary's. I went to Saint Mary's College in South Bend, IN. All girls school across the street from Notre Dame.